Learn how QEEG can help in lie detection, preventing criminal behavior, and rehabilitating convicted criminals! Quantified EEG (QEEG) measures electrical response in the brain, providing fresh insights into behavior and brain dysfunction. Forensic Applications of QEEG and Neurotherapy presents the latest studies identifying differences in brain function in those individuals with criminal backgrounds. This compelling source explores the frontier of how the QEEG measure can detect lying in persons accused of crimes and supplement neuropsychological evaluations for determining how brain dysfunction may be a factor in criminal behavior. Techniques are discussed for the use of neurotherapy to lessen crime and recidivism rates. Decreasing criminal behavior and recidivism has a positive social impact on communities and can potentially save significant amounts of taxpayer money. The measures and research discussed in this book can potentially be enormously instrumental in verifying, preventing, and treating various types of criminal behaviors. Forensic Applications of QEEG and Neurotherapy examines what the future holds by presenting the innovative applications and approaches that may ultimately lessen criminal behavior, prevent violence, and lower recidivism. Chapters include extensive references, and many include figures and tables to enhance understanding of the material. 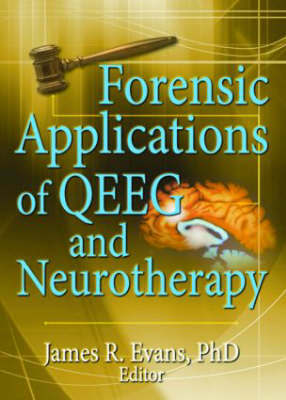 Forensic Applications of QEEG and Neurotherapy is horizon-expanding reading for clinical and forensic psychologists, neuropsychologists, neurotherapists, forensic psychiatrists, prison administrators, neurologists, neuroscientists, and criminal defense attorneys.